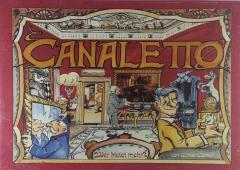 The players purchase artworks at auction, against strong competition from their opponents, so as to sell them on further. But single pieces are as good as worthless, only when a player has secured the last piece of any group may they sell the entire group. And only then do they receive cash that allows them to purchase more. But that's not all, the player who has bought the last piece, also gets to decide which palace's contents will be the next to be auctioned off. Players will need a clear grip of tactics and clever use of their minimal cash resources if they aren't to come away empty handed.